and the mythology behind them. 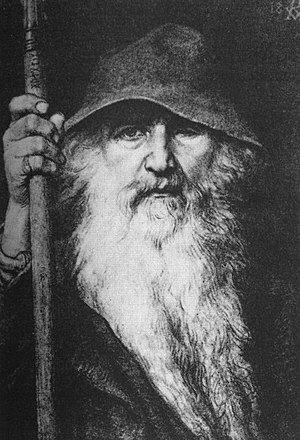 Odin was an heroic seeker of the runes, impaling himself on the World Tree Yggdrasil for nine days and nights in order to get the runes. It struck me after reading the Women’s encyclopedia of Myths and Secrets that indeed he didn’t invent them, but ‘won’ them (by imitating the travail of women in childbirth, traditionally 9 days being the time of a mother’s seclusion, the article tells us). So, wheels within wheels… Did he supplant the goddess, wrongly? Or does every artist have to sacrifice ‘himself to himself’ as Odin says of himself on the Tree? 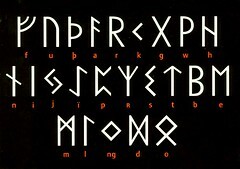 In order to win for himself the runes of true art? 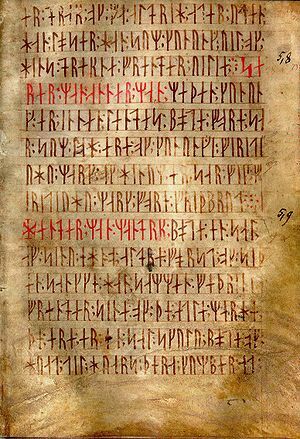 Or should we emulate Bragi, who became the greatest bard of all by letting Idunn his wife carve the runes on his tongue? So, we can’t blindly trust any hero to tell us what to do, no matter if they are the ‘All-father’ Odin himself. We must bring our moral compass as well as an open mind, to all our encounters with gods and goddesses, no less than with ‘ordinary’ mortals. We are in a labyrinth – it is called Life on Earth. That’s an exciting adventure, the stuff of page-turning epics. We need that compass, though. I think this is what makes a good Story: it has the twists and turns and blind alleys of a labyrinth, but also the author is showing the heroes and heroines using their moral compasses, trying to steer a straight course morally while dealing with the chaos of the unfolding multi-dimensional labyrinth of life. So, we have it from the greatest wizard of all Middle Earth: the defense of the True West is a matter of weeding the fields set before us. And we need that moral compass, to tell what may be weed and what be wheat – or some other good plant!